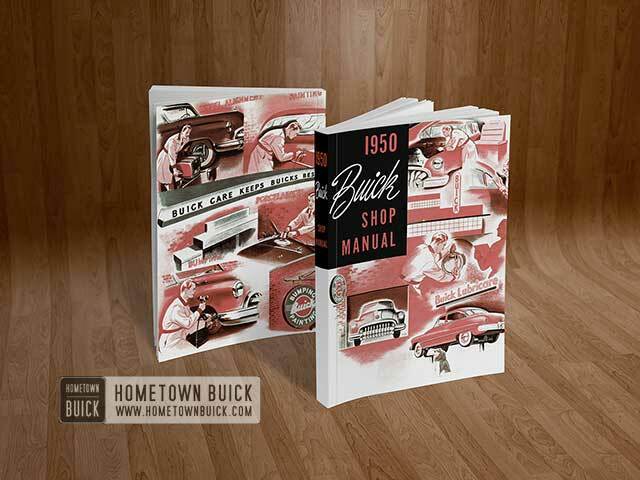 1950 Buick brakes must be tested on dry, clean, reasonably smooth and level roadway. A true test of brake performance cannot be made if roadway is wet or greasy, or is covered with loose dirt so that all tires do not grip road equally. A true test cannot be made if roadway is crowned so as to throw weight of car toward wheels on one side, or is so rough that wheels tend to bounce. Test brakes at different car speeds with both light and heavy pedal pressure; however, avoid locking the wheels and sliding the tires on roadway. This practice is injurious to tires and it does not give a true test of brake performance. adjustment at all brake shoes, and should be used during brake adjustment. This procedure, however, does not test the self-energizing action as the primary shoes come in contact with drums, nor the braking action as car weight is transferred forward on deceleration. Brake Shoes Not Properly Centered. If brake shoes are not concentric with drums they will not make full contact and braking area will be reduced. Adjust brake shoes, paying particular attention to anchor pin adjustment for centralization of shoes in drums (par. 8-15). Improper Brake Lining. Improper grade of lining lose their gripping qualities after some use. Replace with genuine Buick lining (par; 8-16). Weak or Broken Brake Shoe Spring. Does not allow proper releasing of brake shoes. Replace spring and check brake shoe adjustment (par. 8-15). If brake pedal adjustment does not correct the 1950 Buick brake trouble, remove master cylinder for disassembly and thorough cleaning (par. 8-19). CAUTION: Never insert a test wire through compensating port as this may leave a burr which will cut a groove in piston primary cup. Wheel Cylinder Piston Cups Distorted. If the rubber parts in master cylinder are found to be swollen and distorted (step 2, above), it indicates the presence in hydraulic system of a mineral base oil such as kerosene, gasoline, or engine oil. Such substances will cause all rubber parts to swell and distort, therefore it is usually necessary to thoroughly flush the hydraulic system (par. 8-10) and replace rubber cups in wheel cylinders (par. 8-18). Pedal or Master Operating Lever Improperly Installed on Shaft, Dynaflow Car Only. If pedal and lever are not installed on shaft in proper relation to each other brakes may be kept partially applied (par. 8-11). Brake Drum Condition. Carefully inspect brake drums for out-of-round, scoring, cracks, or hard spots. Rebore any drum if out-of-round or scored (par. 8-17). Replace any drum which is cracked or has hard spots in braking surface. Foreign Material Imbedded in Lining. Metallic particles or grit imbedded in brake lining will cause squeaking. Sand the surfaces of linings and remove all particles of metal. In some cases it may be necessary to dress the lining surfaces with a portable resurfacing machine in order to properly clean the surfaces and insure good contact with brake drums.